I've long been a fan of good illustration and this exhibit is just down the street from my home. Strange new worlds, life forms and civilizations have arrived at the Chazen Museum of Art. There are also strange old worlds, old friends and fairytales. Fantastic Illustration is two exhibits in one, American and European. The old world is represented by art created for lavish “gift books,” with elaborate covers and lush interior illustration. Many of the artists will be familiar to fans of children’s books: Aubrey Beardsley, Arthur Rackham and the brilliant British cartoonist William Heath Robinson. Faeries by Brian Froud and Alan Lee is in my library. 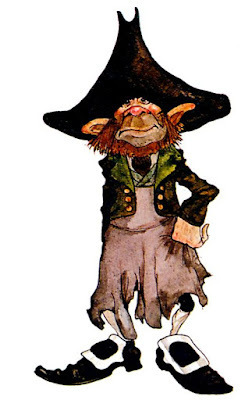 The creature above is one of their illustations of leprechauns.